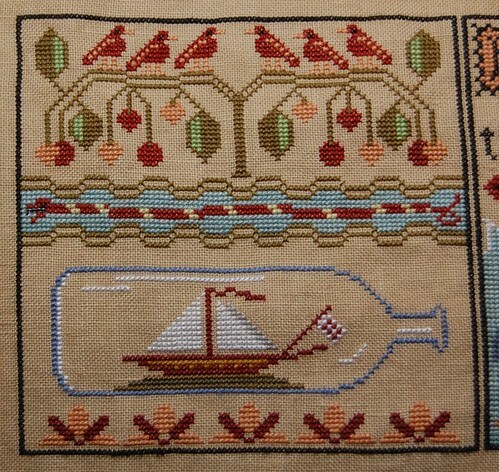 Nicole's Needlework: Shores Block 10 Finished! 40 ct. Summer Khaki over-dyed with Tan Rit Dye, NPI Silks. Well, I promise it won't be two weeks again before my next post! Write soon! Gorgeous!!!! The colors really are pretty. Beautiful! I love the birds on top. I love this pattern, I've got it in my stash with the fabric, I may just have to start it for an autumn/winter project. Your progress is lovely, and don't worry about it being too long between posts we all understand how life gets in the way. Gorgeous! I laove the colors on this block! Shores looks fantastic, as always. :) I so want an iPad!! My brother has one and I have checked out the iBook app. I was amazed by the links in a non-fiction book to news stories, you tube, etc. that were about the historical events in the books. Amazing! Can't wait to see the model you stitched. Nice stitching as usual! Can't wait to see the Primitive Needle design....happy stithcing and reading. Love it - looks great! Wonderful block! the colors are gorgeous. Beautiful, Nicole. I like it more each time I see it. I love the fabric on this one. I may have to "copy" you when I get ready to start mine. Block 10 looks fantastic Nicole! I think you are working round yours differently to me. How many blocsk have you done now? I'm on block 8. Bummer about the nook, but I really like my iPad as well for reading. We did something rather rash a couple weeks ago and got both of our kids their own nooks. We were spending about $50 a month on new books (our library has months-long waiting lists for the newer books), so we figured it was a good investment. $1.99 for a download is way cheaper than a paperback! Gorgeous! You are really moving along on this. I really need to get mine back out seriously. 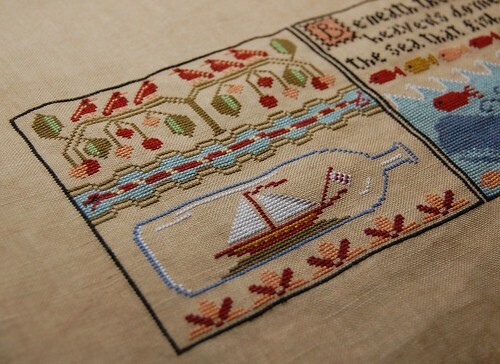 I really need to stitch on my Shores. JUst gorgeous, Nicole...you have to be one of the best stitchers and photographers I know. Always a joy to see the pics that you stitch and share, keep up the wonderful work. Your stitching looks stunning - the colours are so vibrant. Well done! Woohoo! Moving right along on your Shores, Nicole! The colors are really nice, aren't they? Your Shores looks great, Nicole! It'll look fantastic in your new home! Looks fantastic Nicole - the colors in your photo are wonderful! You are almost to the end!